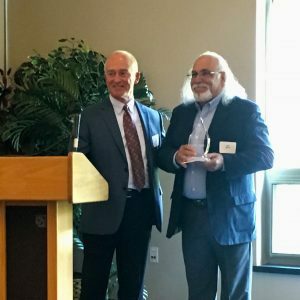 Bob Mazza was recently presented with the Lake & Smith Award at the annual meeting of the North East Community Foundation. The North East Community Foundation assists donors in improving the quality of life in and around North East, Pa., and by creating endowments to benefit local nonprofits. Each year at its Annual Meeting, The North East Community Foundation presents a special award to honor a local individual, family or non-profit organization who demonstrates excellence in community service and a commitment to the residents and community of North East. His son Mario noted that this list doesn’t even round out the full extent of his involvement, all with the time to have grown a successful wine (and now spirits and beer) business over the course of 45 years. The Mazza family is proud of our founder and leader, Bob Mazza, and we strive to continue to improve our community as we continue to grow.